The Tyee Bell was ringing last night in celebration of a couple of the season’s largest catches. We just love celebrating at the Bell Ringer! Joe & Ruth H spent some quality time on the halibut grounds this week with their guide Jake Harach… and they made the most of it! Ruth boated a perfect “over” at 51 pounds but Joe had to contend with some serious heavy lifting. He got his 30-minute workout wrangling a massive fish that taped out to 71 inches in length for a calculated weight of 187 pounds. A few quick photos alongside the boat and a measurement and then she was gone with a splash! Eighteen cracks of the bell on Thursday night and presentation of a gold halibut pin capped a great week of fishing. Ten-year-old Hayden B returned to the lodge this week with his Grandpa Sam and his Aunt & Uncle to share their annual fishing adventure. Hayden was learning to use the single-action salmon gear that we use on the BC coast and he was making good progress, albeit with a few bruises and mixed success. On Thursday morning their veteran guide “Rainman” Dan chose to “turn right” to fish the kelp beds past Cape Edenshaw and they hooked up with “a real good fish.” It was Hayden’s time. And he was up to the task – kept the tip up and didn’t lock up on the Islander! Twenty minutes of tug-o-war and Dan slipped the net beneath a very sizable salmon. Here was one excited young man! Of course he was dying to know how big his fish was but managed to stay out all day. When his turn at the scale came at the Bell Ringer last night there were lots of bets on the size of Hayden’s fish. “Rainman” hoisted the big beauty onto the hook and covered the numbers while the scaled settled. Seconds later he lifted his hand… 45-pounds was the weight! 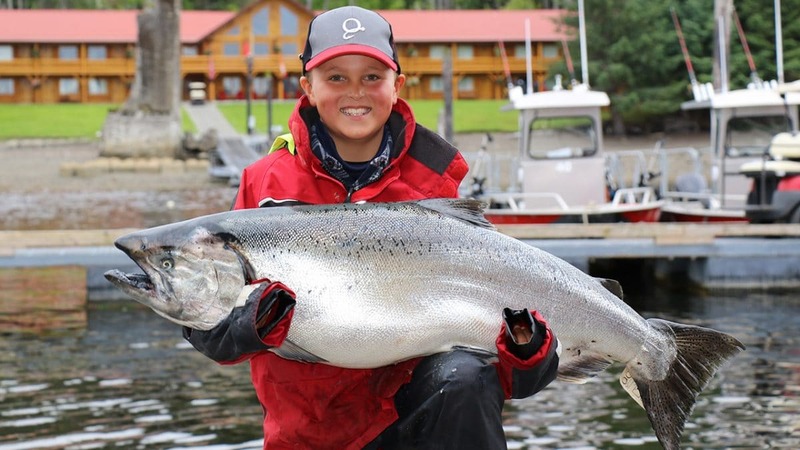 Welcome to the Tyee Club Hayden! That’s a marvelous catch and quite an achievement for a young angler. Congratulations! With a little boost from his guide he gave the Tyee Bell four good dings to a huge round of applause from the crowd, a moment that we’re sure he’ll remember for a very long time.